Once I got the hang of cookie making, I started experimenting. And these cookies are result of one such experiment. You may remember me talking about my hubby’s cardamom aversion, hence i baked chocolate cookies for him. Inspired by the Almond Cardamom Cookies, I baked vanilla cookies for him and Zini. I did few experiments with the amount of vanilla in the cookies and finally hit a bull’s eye with the current recipe. And because i was baking them for Zini also i had to make them extra healthy!! Hence i went the whole wheat and jaggery way.. 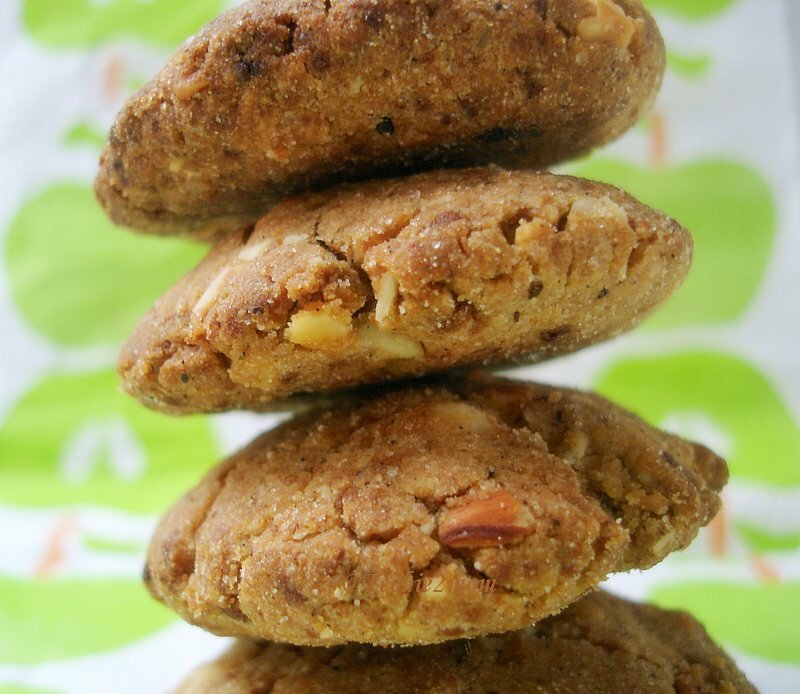 Egg free, refined sugar free, nuts and whole wheat vanilla cookies…Phew!! 1) Mix all the dry ingredients. 2) Now, add the butter. It really is important to keep it at room temperature. 3) Mix well and knead the dough. If needed add milk, little by little and knead. 4) Pre-heat the oven to 180 degree C.
6) Take the dough of the size of a lemon and flatten it using a fork to get the circular, cookie like shape and arrange on the greased baking tray. 7) Bake the cookies at 180 degree C for 20 minutes (time may vary depending on your oven). 9) Take out and cool on wire rack. Store in an air-tight container and enjoy!!! So beautiful n lovely cookies.. where were u Pankti..?? So long! Missed you here ! This is a keeper recipe! It indeed is a keeper recipe.. I think baking is also about practice and we become better. I wish I could but we hardly like anything with sugar, maybe once a while. So I bake once a while and all is given to others. I like these refined sugar free, crispy and wonderful cookies. The nuts protruding out are another attraction. Would love to see you bake….. Healthy cookies! Nice pics too. The cookies look wonderful ! love the click too Pankti ! delicious and healthy cookies,happy Diwali and sal Mubarak. So healthy with wheat flour and jaggery… Yummy cookies.. Cookies look so crisp and yum,you have got a nice space c,happy to follow you,would be glad if you follow me back! Those cookies look extremely yum, crunchy and gigantic…. You can’t replace butter with oil in this recipe. However to make it vegan you can try replacing butter with nut butter (peanut, cashew or almond), in that case reduce the amount of nuts added to the recipe.